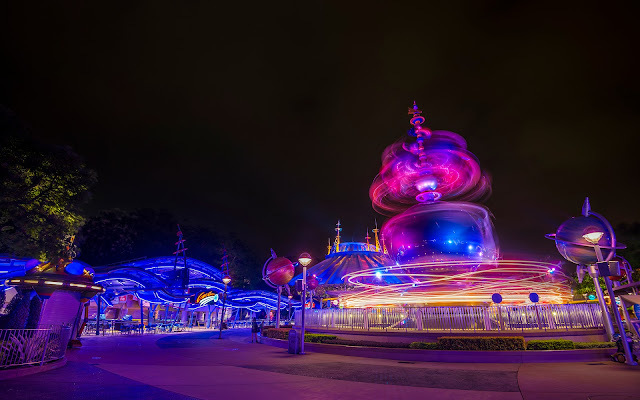 Our international Tomorrowland journey ends over at Hong Kong with a glance at their Tomorrowland. Hong Kong Disneyland doesn't get a lot of love among Disney fans (or even the local population), but it's still a really nice, charming little park. Its scale is much closer to that of Disneyland California than the more grand spaces of Walt Disney World and Tokyo Disney and the others. But it has its differences. For example, Hong Kong's Tomorrowland seems to take California's traditional aesthetic with a layout that is more spread out around a hub... and at the center of the spoke, the Orbitron, aka rocket ships that adorn every Tomorrowland around the world. The view below is particularly eventful, since it also carries to Space Mountain in the background, while the Comet Cafe stands just to the side. And though the walkways are still, there's something vibrant about the Orbitron still whirling away through the night. The Orbitron spins at night at Hong Kong Disneyland.